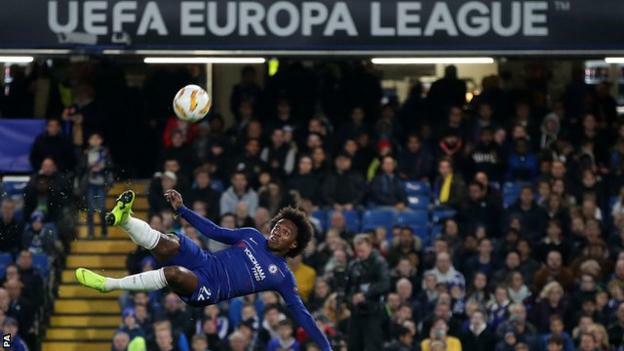 Ruben Loftus-Cheek hit a brilliant hat-trick as Chelsea coasted to victory in a one-sided Europa League game against Belarusian champions Bate Borisov. The Blues, inspired by their England midfielder, were far too strong for their opponents, stretching their lead at the top of Group L to six points with three games to play. Loftus-Cheek swept Maurizio Sarri's side ahead with just one minute and 42 seconds on the clock after being picked out by Davide Zappacosta's low cross. The 22-year-old doubled the lead with a side-foot volley from Willian's corner and sealed his first competitive hat-trick with a sumptuous 20-yard finish before Aleksei Rios scored a consolation. Bate goalkeeper Denis Scherbitski produced sublime saves to keep out Zappacosta and Olivier Giroud as Chelsea dominated from start to finish. Can Loftus-Cheek force his way into the side? This was only Loftus-Cheek's fourth Chelsea appearance of the season - as many games as he played for his country at the World Cup in Russia during the summer. He grasped the opportunity with both hands after Sarri made eight changes to the side that started the 2-2 draw with Manchester United last Saturday. Having scored Chelsea's first hat-trick in Europe since Didier Drogba in 2006 - and the first English player to score a European hat-trick for Chelsea since 1971 - Loftus-Cheek will hope he can now force his way into Sarri's Premier League side. He has been limited to just 33 minutes of top-flight action since the Italian took charge in the summer. In contrast, N'Golo Kante and Jorginho have played every minute of every league game, while Mateo Kovacic has managed 476 minutes. Meanwhile, Ross Barkley has clocked up more than 300 minutes in the engine room this season, earning himself an England recall. With Chelsea making an unbeaten start under Sarri, Loftus-Cheek could well have to remain patient or consider another loan move in the January transfer window after impressing at Crystal Palace last season. There certainly won't be a lack of interest should the Blues' boss sanction a temporary switch - especially after this highly impressive performance. Bate Borisov looked on a hiding to nothing after falling 2-0 down inside eight minutes. Chelsea should have won by more but after cruising into a 3-0 lead before the hour mark, they eased off and the visitors were able to score when slack marking let in Rios after a corner. Sarri was angry his side allowed Borisov to score - a sign of the high standards the former Napoli boss expects at Stamford Bridge. Much tougher tests lie in wait - Tottenham at Wembley on 24 November and Manchester City at Stamford Bridge on 8 December - yet Chelsea continue to thrive under Sarri. They are now unbeaten in 13 games this season, third in the Premier League table, in the last 16 of the Carabao Cup - after negotiating a tricky tie at Liverpool - and could book their place in the last 32 of the Europa League with two group games to spare. Ruben Loftus-Cheek scored more goals in the opening 53 minutes of this match (three) as he had in his previous 35 games for Chelsea (two). Chelsea have won their first three group stage games in a season in major European competition for the first time since the 2010-11 Champions League campaign. 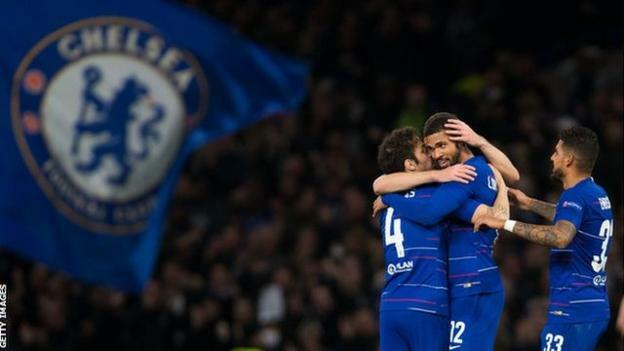 Loftus-Cheek became the first English player to score a European hat-trick for Chelsea since 29 September 1971, when Peter Osgood scored five goals and Tommy Baldwin netted three against Luxembourg's Jeunesse Hautcharage in the Cup Winners' Cup. Willian made his 250th appearance for Chelsea in all competitions since joining the club in August 2013. Chelsea face two Premier League games - away to Burnley and home to Crystal Palace - and a Carabao Cup tie against Frank Lampard's Derby County before travelling to Belarus for the return match against Bate Borisov on 8 November (17:55 GMT). Match ends, Chelsea 3, BATE Borisov 1. Second Half ends, Chelsea 3, BATE Borisov 1. Attempt missed. Callum Hudson-Odoi (Chelsea) left footed shot from the left side of the box is too high. Assisted by Victor Moses. Foul by Jasse Tuominen (BATE Borisov). Attempt saved. Ruben Loftus-Cheek (Chelsea) left footed shot from a difficult angle on the right is saved in the bottom left corner. Victor Moses (Chelsea) wins a free kick on the right wing. Foul by Maksim Volodko (BATE Borisov). Goal! Chelsea 3, BATE Borisov 1. Aleksey Rios (BATE Borisov) left footed shot from very close range to the bottom right corner. Assisted by Igor Stasevich with a cross following a set piece situation. Maksim Skavysh (BATE Borisov) wins a free kick on the left wing. Substitution, Chelsea. N'Golo Kanté replaces Mateo Kovacic. Offside, BATE Borisov. Maksim Volodko tries a through ball, but Maksim Skavysh is caught offside. Substitution, BATE Borisov. Evgeni Yablonski replaces Dmitri Baga. Corner, Chelsea. Conceded by Aleksandar Filipovic. Attempt blocked. Callum Hudson-Odoi (Chelsea) right footed shot from outside the box is blocked. Assisted by Ruben Loftus-Cheek. Attempt missed. Mirko Ivanic (BATE Borisov) right footed shot from outside the box is too high. Assisted by Maksim Volodko. Attempt saved. Olivier Giroud (Chelsea) left footed shot from the centre of the box is saved in the top centre of the goal. Assisted by Victor Moses. Substitution, BATE Borisov. Jasse Tuominen replaces Nikolai Signevich. Attempt saved. Davide Zappacosta (Chelsea) right footed shot from outside the box is saved in the bottom left corner. Assisted by Mateo Kovacic. Offside, BATE Borisov. Stanislav Dragun tries a through ball, but Igor Stasevich is caught offside. Aleksandar Filipovic (BATE Borisov) wins a free kick in the defensive half. Attempt saved. Mirko Ivanic (BATE Borisov) right footed shot from the left side of the box is saved in the centre of the goal. Assisted by Igor Stasevich. Attempt blocked. Maksim Skavysh (BATE Borisov) left footed shot from outside the box is blocked. Assisted by Mirko Ivanic. Attempt saved. Victor Moses (Chelsea) left footed shot from outside the box is saved in the centre of the goal. Assisted by Callum Hudson-Odoi. Substitution, BATE Borisov. Mirko Ivanic replaces Alyaksandr Hleb. Substitution, Chelsea. Victor Moses replaces Willian. Attempt saved. Willian (Chelsea) right footed shot from outside the box is saved in the top centre of the goal. Assisted by Emerson. Foul by Nikolai Signevich (BATE Borisov). Goal! Chelsea 3, BATE Borisov 0. Ruben Loftus-Cheek (Chelsea) right footed shot from outside the box to the bottom right corner. Foul by Stanislav Dragun (BATE Borisov). Foul by Aleksey Rios (BATE Borisov).